It wasn’t exactly “crowdsourcing”, but 15casual patrons of a certain local tavern, having grown a fondness for the Sport of Kings, and enjoying a place to actually wager within the city limits, eventually let their passion overtake them and purchased a thoroughbred racehorse. It started in a conversation between two golf buddies, somewhere between here and Scottsdale, Arizona. On a beautiful spring morning, Michael Anthony and Karl Burns were driving to play in a company tournament. The conversation casually turned to offline horse-betting at San Clemente’s OC Tavern which led to the question ‘how fun would it be to own a race horse?’ Three weeks later 15 partners were ready to invest. OC Tavern Stables was officially registered and approved by Cal Horse Racing Board on July 9th. The partners selected Bob Hess as their trainer and met with Bob at the OC Tavern on May 7th to go over the good and bad of owning a horse. The explanation, basically, was “it’s like owning a boat ...” But they invested anyway. On May 21st, Bob Hess made a $40,000 claim for “General Ann” at Belmont Park. The name General Ann comes from the first female Four Star General in the Army. Her name is Ann Dunwoody who retired in 2012. General Ann ran one more time at Belmont Park on June 26th after the change of ownership. An expectedly-large crowd had filled the OC Tavern to watch the home girl run. The afternoon included a surprise showing by Triple Crown winner Victor Espinoza who had stopped off for lunch after kicking off an event in Monarch Beach for the City of Hope. Victor is a major contributor to City of Hope and was even greeted at the Tavern with a $1,000 check from the partners of this newly-formed OC Tavern Stables to help his charity. The Tavern was full as General Ann entered the gate and the crowd screamed as she ran the stretch ... neck and neck, losing by a nose to the favorite in an exciting finish. She took second, earning a respectable $11,000 for her efforts. 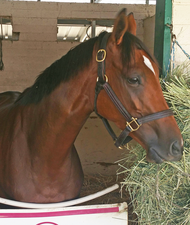 Since then, the General was flown to Ontario, where she was trailered to Bob Hess’ barn at Santa Anita and then, in the middle of July, was moved to her current home in Del Mar. She was scheduled to run again on July 31 down where the ‘turf meets the surf’. Forty locals attended. Bets were placed, she was the odds on favorite. But then ... well, her late scratch was blamed on a jockey that showed up inebriated and wearing the wrong silks. (Sources confirm, he had not been at the OC Tavern). Her next run has yet to be announced. Stay tuned on this one. The partners involved are: Michael Anthony, Karl Burns, Mike Dougherty, Rick Eber, Ed Empero, Chris Fosselman, Mike Herbert, Robert Hess, Bob Johnson, Scott Jones, Jay Longley, Ken MacDonald, Kirk Marten, Gene Nesheim and Mike Ryan. The partners encourage anyone interested to come and watch her run. Contact Michael Anthony at (949)370-3590.